Truth be told ... the SheppyBrew Brew Master is fascinated by Bigfoot. He has been since he attended grade school in the Pacific Northwest. He has never really believed in Sasquatch, but has always hoped that someday someone would prove him wrong. As I shared on my blog, I think being a Sasquatch hunter (to hunt as in "to find" ... not as in "to shoot") would be a great job. See Sasquatch Hunting. I think I would like to party with Sasquatch. I think the perfect beer to drink while hunting Sasquatch would be a German Altbier. Why? Well, when I think of Sasquatch, I think of forested wilderness areas far away from big cities. I think of old-fashioned rustic living in log cabins deep in the wood. Altbier makes me think of old-time German woodcutters living deep in the forest. I bet Hansel and Gretel's father drank lots of altbier. It might not make sense to you, but my strange and wonderful mind draws a parallel between Bigfoot and German Alts. If you don't like the parallel, you can name your German Altbier something else. SheppyBrew is naming theirs "Sasquatch Hunter". Sasquatch Hunter has a clean, full, rich German malt character. It has a firm, but not overpowering hop bitterness and contains significant floral, slightly spicy hop flavor and aroma. It is fairly dry and not very high in alcohol. It is a beer you can drink and drink camping in the forest looking for Sasquatch. I would have liked to brew this on 12/21, the end of the Mayan Calender. Since 12/21 was a work day for me, I decided to push it off to my next brew-day which ended up being New Year's day 2013. This ended up being the first beer of my 2013 goal to brew up at least one all-grain batch in all 23 categories of the BJCP (see http://blog.ericshepard.com/search/label/BJCP%20goal for more information on that). 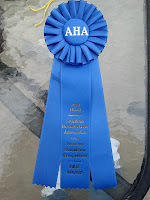 I entered this beer in the AHA's 2013 National Homebrew Competition. When the Denver Region results were posted, I was shocked to discover that I had won 1st place in Category 7 : Amber Hybrid Beer! The first place finish allowed this beer to advance to the national round. Unfortunately, I did not have any of this beer left, so I had to re-brew it for nationals. It scored well in the nationals final round, but did not medal. Make 1.75 liter starter a few days before brew day. Ferment as close to 60F as possible for the first 3 or 4 days. Let warm up to whatever it wants after that. bought ingredients today. Brew day tomorrow. Brewed last Sunday. Og1.050. Fermentation going great. Kegging. 1.014 gravity. Sample tasting good, although maybe a bit fuller in body than I expected. Moved to kegerator. Carbonating at 20psi.